The application of matrix-assisted laser desorption/ionization time of flight (MALDI-TOF) mass spectrometry (MS) directly to blood culture broth expedites the identification of bacteria. The presented method is a rapid and reliable method for identification of Gram negative bacteria directly from blood culture broth. Gray, T. J., Thomas, L., Olma, T., Mitchell, D. H., Iredell, J. R., Chen, S. C. Rapid Identification of Gram Negative Bacteria from Blood Culture Broth Using MALDI-TOF Mass Spectrometry. J. Vis. Exp. (87), e51663, doi:10.3791/51663 (2014). An important role of the clinical microbiology laboratory is to provide rapid identification of bacteria causing bloodstream infection. Traditional identification requires the sub-culture of signaled blood culture broth with identification available only after colonies on solid agar have matured. MALDI-TOF MS is a reliable, rapid method for identification of the majority of clinically relevant bacteria when applied to colonies on solid media. The application of MALDI-TOF MS directly to blood culture broth is an attractive approach as it has potential to accelerate species identification of bacteria and improve clinical management. However, an important problem to overcome is the pre-analysis removal of interfering resins, proteins and hemoglobin contained in blood culture specimens which, if not removed, interfere with the MS spectra and can result in insufficient or low discrimination identification scores. In addition it is necessary to concentrate bacteria to develop spectra of sufficient quality. The presented method describes the concentration, purification, and extraction of Gram negative bacteria allowing for the early identification of bacteria from a signaled blood culture broth. Patients with bloodstream infection (BSI) due to bacteria continue to have high in-hospital mortality, ranging from 6-48%1. The delivery of appropriate empiric antibiotic promotes survival and in the subset of patients with severe sepsis, each hour delay to appropriate therapy correlates to decreased survival2,3. Accordingly, a key objective of the clinical laboratory is to rapidly detect, identify and communicate the presence of bacteria in blood cultures to inform clinical decisions. It has been demonstrated that the microbiology laboratory has the greatest influence on antimicrobial therapy at the time of reporting the Gram stain4 and recently, an observational study demonstrated that matrix-assisted laser desorption/ionization time of flight mass spectrometry (MALDI-TOF MS) performed directly on blood culture broths influence prescribing in over one third of BSI caused by Gram negative bacteria5. The commercial development of MALDI-TOF MS has led to an efficacious laboratory tool for the identification of microorganisms6,7. The technology is now well established and has been integrated into many laboratories for rapid and accurate identification of microorganisms isolated on solid media6,8. The direct application of MALDI-TOF MS to blood culture (BC) broth that have signaled “positive” for microorganisms appeals to both clinicians and laboratory managers because of the potential to obtain an earlier identification of microorganisms at low cost. The clinical utility of direct application of MALDI-TOF MS to blood culture broth has been limited by the wide range of sensitivities observed when compared with standard phenotypic culture based methods of identification, with reports of successful identification of Gram negative bacteria ranging from 47-98.9%9-11. The variation in sensitivity likely relates to the BC broth composition, initial bacterial concentration, variation in sample preparation methods as well as the array of Gram negative organisms encountered in study populations9. Compared with these other published protocols the method presented here avoids the use of ethanol, ammonium chloride or additional (non-matrix) acetonitrile. As a result the bacterial pellet will remain viable (until the point of protein extraction) allowing for potential phenotypic susceptibility testing methods to be applied directly to these organisms in broth. In addition, the presented method has been shown to be inexpensive, reliable and rapid with bacterial identification available within 25 min of the blood culture Gram stain results, with minimal ‘hands on’ time12. This method is a simple in-house spin-lysis protocol utilizing formic acid extraction applied directly to positive blood culture broths to identify Gram negative bacteria with MALDI-TOF MS technology. Remove the signaled blood culture bottle from the continuous monitoring incubation cabinet and place it into a biological safety cabinet. Note: Bottles can contain hazardous microorganisms and universal precautions need to be followed. Due to the risk of infectious aerosols in sampling, all sampling procedures must be performed in a Biosafety Class II laminar flow cabinet. Prepare a Gram stain from the signaled blood culture broth as per local institutional protocols. Note: When Gram negative organisms are identified on microscopy the blood culture broth is processed as per the following method. When Gram positive organisms are identified, an alternative molecular method targeting genetic identification and resistance markers is applied to the broth (not addressed in this article)13. Gently mix the blood culture bottle by inverting 2-3x. Within the biosafety cabinet attach a 10 ml syringe to a safety blood transfer device. Attach the blood transfer device to the blood culture bottle and withdraw 5 ml of the broth into the syringe. Transfer the aspirated BC broth into a serum separating tube. Centrifuge the serum separating tube at 1,250 x g for 15 min which removes a large volume of red blood cells. Aspirate and discard the supernatant using a sterile transfer pipette being careful to leave approximately 1 ml of the buffy coat immediately above the gel/fluid interface. Note: The aerobic bottles show a clear separation of red blood cells to the bottom of the tube with the gel/fluid interface appearing an opaque white color. In contrast, when applied to the lytic anaerobic blood culture broth the gel/fluid interface appears as a deep red color due to the lysed red blood cell components remaining suspended in the supernatant. Gently mix the last 1 ml of buffy coat fluid above the gel interface with a sterile pipette and then transfer the entire volume into a 1.5 ml microcentrifuge tube. Centrifuge the new tube at 288 x g for 30 sec. Transfer the supernatant using a plastic disposable 1 ml transfer pipette into a new 1.5 ml microcentrifuge tube and discard the tube with the pellet. Note: It is critical in this step that care is taken to avoid the transfer of the pellet. This is particularly important for a specimen being processed from the anaerobic BC bottle as the supernatant remains pigmented and the pellet is not always clearly seen. Centrifuge the specimen at 18,407 x g for 1 min and then aspirate (and discard) the supernatant using a fine tipped transfer pipette to leave as little residual liquid as possible without disrupting the pellet. Resuspend the residual pellet in 1 ml of sterile DNAse and RNAse free water by pipetting up and down. Note: Some authors have described the use of alcohol solutions in place of sterile water to resuspend the pellet which renders bacteria non-viable. Centrifuge the resuspended solution at 18,407 x g for 1 min. Aspirate and discard the supernatant, again using aspiration with a fine tip pipette ensuring that as much liquid as possible is removed. Resuspend the pellet in 10 µl formic acid (70% v/v). Note: Formic acid can affect the body if it is inhaled or if it comes into contact with skin. When preparing or manipulating solutions it is recommended that staff use a fume cabinet in addition to personal protective equipment. Mix well using the pipette to ensure a homogenous resuspended solution. Using the pipette tip to physically disrupt the pellet may be necessary to ensure a more homogenous solution. Inoculate a clean MALDI-TOF target plate with 2 µl of the prepared suspension per target spot. Prepare 3 target sites for each sample to overcome the occasional problem of failed reads. Allow the MALDI-TOF target plate to dry. The rate of drying can be increased by placing the plate on the edge of the fume hood to maximize air flow across the plate. Overlay each dried spot with 1 µl of the matrix solution (10 mg/ml α-cyano-4-hydroxycinnamic acid (HCCA), 50% acetonitrile, 2.5% trifluoroacetic acid). Note: Matrix solution can affect the body if it is inhaled or if it comes into contact with skin. When preparing or manipulating solutions it is recommended that staff use a fume cabinet in addition to personal protective equipment. Allow the MALDI-TOF target plate to dry on the edge of the fume cupboard as described above. Ensure a homogenous preparation fills each of the target spots on the plate. Insert the MALDI-TOF target plate into the MALDI-TOF mass spectrometer. Ensure the plate is sitting flush with the spring-loaded plates. Note: do not insert the target plate until all target spots are dry. Ensure the rubber seal is clean of lint, dust and hair to allow the required vacuum conditions can be created. Close the MALDI-TOF stage lid and then press the “in/out” button on the front of the instrument. The lid will now lock and allow the necessary vacuum to be created. Open the MALDI Biotyping and FlexControl software. Within the Typing software select “new classification” from the dropdown menu titled “file”. Name the project and then select “new”. Select “Next” to complete the setup within the Typing software. Within the Control software window identify the on-screen graphic of the target plate. Highlight the MALDI-TOF target spots that are in use by moving the mouse over the inoculated spots while holding down the left mouse button. Use the right mouse button to click anywhere on the selected target positions and then select “add Analytes” from the dropdown menu. Add blood culture identification details to the “ID” column for each of the target spots and click “next” when complete. Select the commercial “taxonomy” spectra database and select “next”. Note: Laboratories may utilize additional in-house or commercial databases to increase the number of reference spectra. Click “finish” and the MALDI-TOF MS will commence generating spectra. Note: MALDI-TOF settings were as per manufacture’s settings (linear positive mode, 60 Hz laser frequency, 20 kV acceleration voltage, 16.7 kV IS2 voltage, 170 nsec extraction delay, and 2,000-20,137 m/z range). If the MALDI Control software fails to generate peaks, manual acquisition of spectra may be performed (method not described). Once the spectra are acquired and analysis is complete, select the “+” button next to species identification on the Typing software to expand the identification list for each target. Study the top 5 identifications, noting if the top 5 are similar. Discordant top 5 genera with scores ≥1.7 of the same target spot raised the possibility of mixed broths. Note: MALDI-TOF technology has poor sensitivity for detection of mixed broths. For example, when a broth contains mixed species a high confidence score may be identified for just one of the mixed species. When a score ≥ 2.0 is noted for the highest match on a target spot, report the species. When the highest score on a target spot is ≥1.7, but < 2.0, report the genera only. If additional criteria of the top 5 identifications are concordant, then report to species level. When all spectra are complete press the “in/out” button on the MALDI-TOF machine. Open the MALDI-TOF target plate receptacle and remove the MALDI-TOF target plate. If using a reusable MALDI-TOF target plate, clean all target spots using alcohol and store the MALDI-TOF plate at RT once it is clean and dry. The generated MALDI-TOF MS spectra are compared to the integrated reference database of spectra. A logarithmic score is assigned for the confidence of the match between the test isolate and the reference database isolates, with the recommendation of a score ≥1.7 required for probable identification to genera level (Figure 1) and ≥2.0 for probable identification to species (Figure 2). Report to species level when the score ≥1.7 and the first 5 identifications matched by the Typing software is consistent (Figure 1)12. Figure 3 demonstrates the outcome when a blood culture broth of mixed species is analyzed, in this case Escherichia coli and Serratia marcescens. Note the top 5 matched spectra are discordant. It has been previously demonstrated that mixed genera will only be identified by this method in approximately 30% of mixed broths12. It is important to be aware that with a mixed broth it is possible for a consistent report of a single species with a high confidence score. 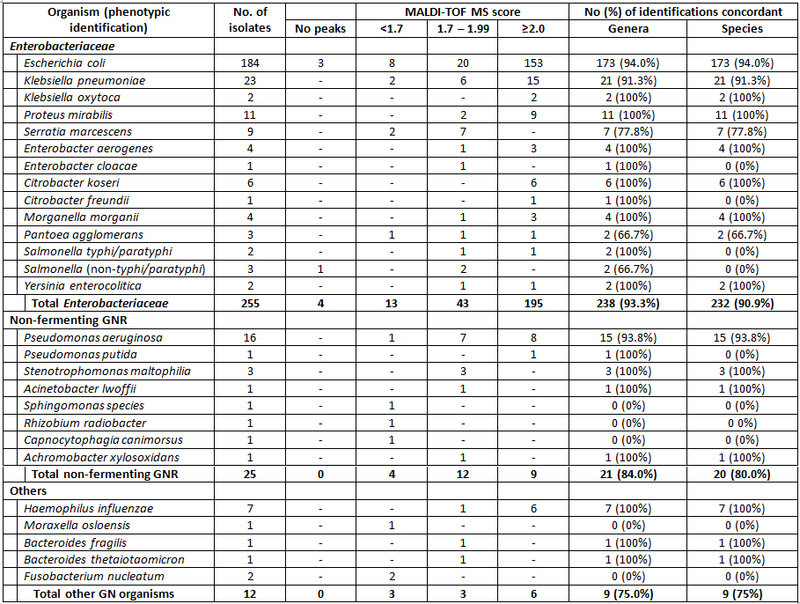 Table 1 summarizes the previously published results from the verification study of this method in which 91.8% of monomicrobial broths achieved a MALDI-TOF score of >1.7, with 100% and 97.0% concordance to genus and species, respectively12. Figure 1. The MALDI-TOF MS generated spectra for Escherichia coli with a logarithmic score of 1.861. To the right is the first 5 matches identified by the Typing software. Note that the species is consistently reported as Escherichia coli. With the score of 1.861 and with the top 5 matches being E. coli the identification is considered reliable to species level12. Please click here to view a larger version of this figure. Figure 2. The MALDI-TOF MS generated spectra for Pseudomonas aeruginosa with a logarithmic score of 2.216. To the right is the first 5 matches identified by the Typing software. Note that the species is consistently reported as Pseudomonas aeruginosa. With the high score of 2.216 the identification is considered reliable to species level of identification. Please click here to view a larger version of this figure. Figure 3. The MALDI-TOF MS generated spectra for a mixed blood culture broth containing Escherichia coli and Serratia marcescens. To the right are the first 5 matches identified by the Typing software which reports both Escherichia coli and Serratia marcescens in the first 5 matched spectra. This mixed genera is only identified in approximately one-third of mixed broth cultures12. Improved versions of software in the future may improve the detection of mixed cultures. Please click here to view a larger version of this figure. Table 1. Verification data comparing MALDI-TOF MS performed directly on blood culture broth with subsequent phenotypic identification on subcultured colonies. Concordant identification required a mass spectrometry score on blood culture broth ≥1.7. This table is adapted from a previous publication12. Please click here to view a larger version of this figure. It is important when applying MALDI-TOF MS to blood culture broth that the post centrifugation steps are performed with sufficient care not to remix the separated components. It is particularly important to remove the blood culture constituents and human cellular proteins, including hemoglobin, which may produce spikes interfering with the MALDI-TOF spectra. Although MS manufactures recommend cut of score of ≥2.0 for species and ≥1.7 for genus identification, other reports have suggested lower logarithmic scores (range ≥1.4 to ≥1.6) may be implemented when applied to BC broth10,12,14-18. The implementation of lower MS identification scores in clinical microbiology laboratories should only be considered following appropriate local regulatory and validation procedures. Occasionally poor spectra are generated by this method which are either not matched, or are reported with low confidence scores. Performing duplicate or triplicate spots for each isolate can reduce the inconvenience of repeating the experiment when a single spot fails. Infrequently, all duplicate spots will not score sufficiently for identification. The cause of the poor identification may be due to incomplete database sets, or more commonly, as a result of a low starting concentration of bacteria in the blood culture broth. In a published validation set for the presented method a score of <1.7 was encountered in 8% of clinical isolates and had a slight predominance when performed on anaerobic blood culture bottles12. MALDI-TOF MS technology is unable to separate all the clinically encountered Gram negative bacteria even when isolated on solid media. For example, E. coli will not be distinguished from Shigella species and the Salmonella genera cannot be speciated. As outlined in the results it is important to recognize that when using MALDI-TOF directly on blood culture broth the sensitivity for detection of mixed species is low11,12,18,19. Overall, this approach offers a rapid, inexpensive, and reliable method for identifying over 90% of Gram negative blood culture isolates within 25 min of a blood culture broth signaling. Bearman, G. M., Wenzel, R. P. Bacteremias: a leading cause of death. Arch. Med. Res. 36, (6), 646-659 (2005). Leibovici, L., Shraga, I., Drucker, M., Konigsberger, H., Samra, Z., Pitlik, S. D. The benefit of appropriate empirical antibiotic treatment in patients with bloodstream infection. J. Intern. Med. 244, (5), 379-386 (1998). Kumar, A., et al. Duration of hypotension before initiation of effective antimicrobial therapy is the critical determinant of survival in human septic shock. Crit. Care Med. 34, (6), 1589-1596 (2006). Munson, E. L., Diekema, D. J., Beekmann, S. E., Chapin, K. C., Doern, G. V. Detection and treatment of bloodstream infection: laboratory reporting and antimicrobial management. J. Clin. Microbiol. 41, (1), 495-497 (2003). Clerc, O., Prod'hom, G., Vogne, C., Bizzini, A., Calandra, T., Greub, G. Impact of Matrix-Assisted Laser Desorption Ionization Time-of-Flight Mass Spectrometry on the Clinical Management of Patients With Gram-negative Bacteremia: A Prospective Observational Study. Clin. Infect. Dis. 56, (8), 1101-1107 (2013). Dekker, J. P., Branda, J. A. MALDI-TOF Mass Spectrometry in the Clinical Microbiology Laboratory. Clinical Microbiology Newslette. 33, (12), 87-93 (2011). Seng, P., et al. Ongoing revolution in bacteriology: routine identification of bacteria by matrix-assisted laser desorption ionization time-of-flight mass spectrometry. Clin. Infect. Dis. 49, (4), 543-551 (2009). Neville, S. A., et al. Utility of matrix-assisted laser desorption ionization-time of flight mass spectrometry following introduction for routine laboratory bacterial identification. J. Clin. Microbiol. 49, (8), 2980-2984 (2011). Schmidt, V., Jarosch, A., März, P., Sander, C., Vacata, V., Kalka-Moll, W. Rapid identification of bacteria in positive blood culture by matrix-assisted laser desorption ionization time-of-flight mass spectrometry. Eur. J. Clin. Microbiol. Infect. Dis. 31, (3), 311-317 (2012). March-Rosselló, G. A., Muñoz-Moreno, M. F., de Urriés, M. C., Bratos-Pérez, M. A. A differential centrifugation protocol and validation criterion for enhancing mass spectrometry (MALDI-TOF) results in microbial identification using blood culture growth bottles. Eur. J. Clin. Microbiol. Infect. Dis. 32, (5), 699-704 (2012). Christner, M., Rohde, H., Wolters, M., Sobottka, I., Wegscheider, K., Aepfelbacher, M. Rapid identification of bacteria from positive blood culture bottles by use of matrix-assisted laser desorption-ionization time of flight mass spectrometry fingerprinting. J. Clin. Microbiol. 48, (5), 1584-1591 (2010). Gray, T. J., Thomas, L., Olma, T., Iredell, J. R., Chen, S. C. Rapid identification of Gram-negative organisms from blood culture bottles using a modified extraction method and MALDI-TOF mass spectrometry. Diagn. Microbiol. Infect. Dis. 72, (2), 110-112 (2013). Hazelton, B. J., Thomas, L. C., Unver, T., Iredell, J. R. Rapid identification of Gram-positive pathogens and their resistance genes from positive blood culture broth using a multiplex tandem RT-PCR assay. J. Med. Microbiol. 62, (2), 223-2231 (2013). Saffert, R. T., Cunningham, S. A., Mandrekar, J., Patel, R. Comparison of three preparatory methods for detection of bacteremia by MALDI-TOF mass spectrometry. Diagn. Microbiol. Infect. Dis. 73, (1), 21-26 (2012). Consoir, C., Lörch, D., Schneider, C. Direct identification of bacteria from charcoal-containing blood culture bottles using matrix-assisted laser desorption/ionisation time-of-flight mass spectrometry. Eur. J. Clin. Microbiol. Infect. Dis. 31, (10), 2843-2850 (2012). Martiny, D., Dediste, A., Vandenberg, O. Comparison of an in-house method and the commercial Sepsityper™ kit for bacterial identification directly from positive blood culture broths by matrix-assisted laser desorption-ionisation time-of-flight mass spectrometry. Eur. J. Clin. Microbiol. Infect. Dis. 31, (9), 2269-2281 (2012). Moussaoui, W., et al. Matrix-assisted laser desorption ionization time-of-flight mass spectrometry identifies 90% of bacteria directly from blood culture vials. Clin Microbiol Infect. 16, (11), 1631-1638 (2010). Novel,, et al. improved sample preparation for rapid, direct identification from positive blood cultures using matrix-assisted laser desorption/ionization time-of-flight (MALDI-TOF) mass spectrometry. J. Mol. Diagn. 13, (6), 701-706 (2011). Fothergill, A., Kasinathan, V., Hyman, J., Walsh, J., Drake, T., Wang, Y. F. Rapid Identification of Bacteria and Yeasts from Positive-Blood-Culture Bottles by Using a Lysis-Filtration Method and Matrix-Assisted Laser Desorption Ionization-Time of Flight Mass Spectrum Analysis with the SARAMIS Database. J. Clin. Microbiol. 51, (3), 805-809 (2013).